The prime-time box-office season kicks off this weekend, as Pixar/Disney secedes its traditional Thanksgiving weekend opening to November's 500-pound gorilla. 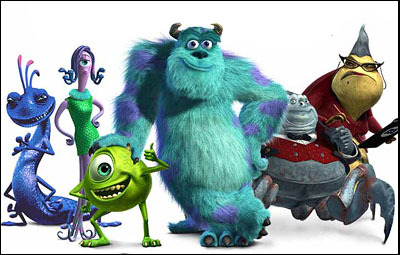 Monsters, Inc. is clearly the class of this weekend, with two other releases hoping to mop up the second prize. A leadoff box-office spot has become a coveted opening over the past few years. Starting with the tremendous surprise of Twister, and following with such films as The Mummy and Charlie's Angels, launching the season has come to be seen as a way to open your movie in relative peace, out of the way of other movies, but more to the point, out of the way of their advertising campaigns. Of course, this isn't simply a function of picking the right weekend; the movie itself has to have a certain level of appeal. Pixar's previous films have certainly proven to have that, with a three-film list that is among the most impressive debuts for a production company ever. In 1995, on Thanksgiving weekend, Toy Story sold itself on its technology and the celebrity voices of Tom Hanks and Tim Allen (a relatively new concept at the time for animated films) to a $29.1 million three-day total. Three years later, A Bug's Life upped the ante, going $32.8/$46.8 million on the three-day/five-day split over that year's holiday. Then the next year, Toy Story 2 broke out in a serious way, bringing in $57.4 million over three days and a tremendous $80.1 million over five days. A few factors would seem to mitigate the monsters' chances of continuing the upward trend. Most importantly, this is not Toy Story 3. Super-sized sequels have ruled the box-office roost in the past few years, with the top ten opening weekend figures now consisting of nine sequels and one remake. Neither of the two lead voices in this film, Billy Crystal and John Goodman, is up to the stature of Tom Hanks. My choice for second place is, ironically, The One. This sci-fi actioner is Jet Li's biggest chance for leading man status yet, and he is definitely being given the marketing support necessary to make it happen. While the director and star of this film claim that any resemblance to The Matrix is accidental (and that's probably true for the movie itself), the marketers have chosen to make it slight more overt, to the point where one could even call it calculatedly so. The ads for this film have been running practically non-stop for two weeks now, so awareness must be high; the trick of course, is always to see how many of those aware will be enticed to come out. The Matrix was able to take Keanu Reeves from joke status to box-office champ in short order; unfortunately, even though they are well done, the novelty may have worn off for superhuman fighting techniques. Another interesting aspect of the ads and the trailer is that, initially, they attempted to spell out the entire concept; this proved too wordy to sell effectively in a 30-second spot. This is a case where a film's uniqueness may work against it. (Quick test; try and explain the plot of this film to a friend without making it sound ridiculous. Didn't think so.) Since then, commercials have only showed Jet Li in his villainous role, and not in the second role of good guy. I suspect this might be the better strategy in the end, as an unexpected angle to the film could help word-of-mouth. Looking at Li's last two films, Kiss of the Dragon took in $13 million over the July Fourth weekend, and Romeo Must Die opened to $18 million in March of 2000. In a healthy 2,894 theaters, I'm looking for The One to capture second place easily with $21 million. What comeback number are we at now with John Travolta? His career choices read like the discount section at the video store; for every success like The General's Daughter, there's a Lucky Numbers and a hard-to-judge Swordfish. At this point, I'm even willing to let Battlefield: Earth be considered an anomaly. This weekend, the Teflon Don of Hollywood is back again with the thriller Domestic Disturbance, likely titled by the same geniuses that brought you Extreme Measures and Final Analysis. The ads have been using the "reveal every plot point, including the resolution" technique that has become annoyingly popular in the last couple of years; while this worked to great success with What Lies Beneath and Double Jeopardy, this has neither the star power nor the female appeal that both the previous films mentioned had. Despite a very wide 2,910 venues, this film's prospects are likely doomed by its ugly-looking ads to approximately a $13 million opening. Last week's number one, K-PAX, has received mixed-to-positive word-of-mouth, and despite the stiff competition this weekend, should be able to pull off a 35% drop to around $11 million. With a slight shift either way for this or Domestic Disturbance, K-PAX could finagle its way into third place. The Halloween honeymoon for 13 Ghosts should end abruptly this weekend; not so much due to the lack of holiday but more to the nature of horror films themselves. Rare is the movie that manages to pull in even a paltry 3.5 times its opening weekend for total box office (about one in five do it). A 50% drop would be par for the course for the ghosts, leaving them at around $7.5 million on the weekend. After that, it starts to get ugly for screens, as only two films are left with more than 2,000 venues. Even staying above 2,000, Bandits loses almost one-third of its venues. Two important films debut for Oscar purposes this weekend: The Coen Brothers' The Man Who Wasn't There, on 39 venues; and certain foreign-language film nominee Amélie, on three. Amélie has the added benefit of capturing the audience award at this year's Toronto Film Festival; four of the last five winners went on to gain Best Picture nominations.